Flexibility and modularity continue to be popular and new products on the market are catering to the concept. At interzum, Hafele showed its Smuso fluid damper/soft-closing system for 35-70 kg weight classes. The advantage to customers is not only do they merely need one soft-closing system, but with the low opening resistance of the fluid dampers, the doors can be moved easily, without a lot of effort. No more plain steel, drawers sides are coming into their own with new design elements. Coming soon from Grass, the Nova Pro Scala, shown here with wood trim, will be available in a wide range of designs and materials, including crystal/glass and stone surfaces to suit all tastes. The pre-fabricated sides can also be mixed and matched for a custom look. The Scala range includes a 90mm-high drawer, a snugly fitting railing version and a closed drawer 186mm high. Apps and digital publications are making it easier for woodworkers on the go. 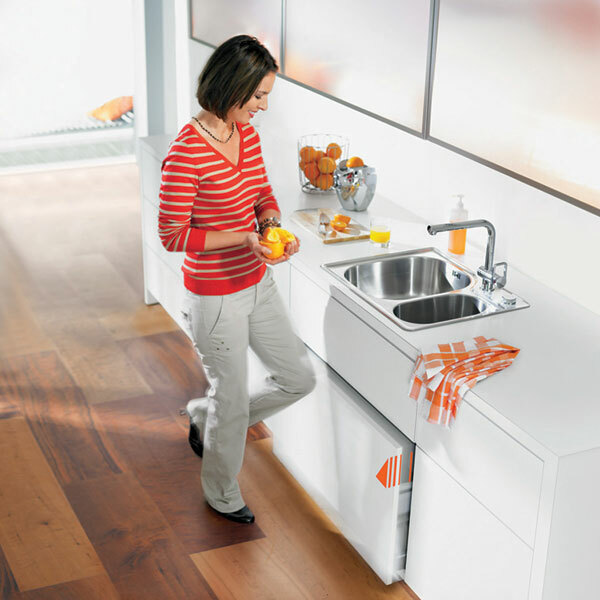 Introduced at interzum, Blum’s digital magazines provide technical information that can be used in product presentations. Also available soon from the company will be an app to provide on-site installers with information about the assembly and adjustment of Blum’s fittings. The once-neglected corner spaces are no longer. Vauth-Sagel is among the companies introducing corner cabinet solutions.Cornerstone features a swiveling system that automatically extends the entire contents out of the cabinet upon opening the door. The unit has an opening angle of 85 degrees. Hardware continues to be more versatile. Salice’s Shelf runner for pull-out shelves, with fixing on the bottom, can be used for display stands, living room and office furniture. It is available with full-extension, Push opening for handle-less furniture, and with Smove decelerated closing. Digital printing makes it easier, faster and economical to create custom designs on surfaces. At the Cologne’s Design Post center, Interprint showed off its latest design capabilities utilizing the industry’s first industrial digital printer for printing wood, stone and other designs on decor paper, using water-based inks. The printer has a maximum printing width of 1,680mm, a printing speed of up to 150 mpm and a data transfer speed of 2.2 terabytes/second. Narrow reveals, new organization systems and functional designs distinguished many of the offerings at 2015 interzum. Shown, Hettich’s InnoTech Atira drawer system features sharp contours, versatile side elements, and an attractive interior. The concept is based on a single drawer side profile. Glass-like surfaces are finding their niche in the marketplace. Shown by REHAU, RAUVISIO crystal offers break-resistance and scratch-resistance features for use in furniture, doors, kitchen and bath cabinetry and store fixtures/displays. REHAU recently added five colors to the glass laminate lineup — Corniola (red), Menta (green), Azzuro (blue), Fumo (grey) and Sabbia (beige) — as well as matte finishes. Interzum 2015, held May 5-8 in Cologne, Germany, had more than 57,500 industry visitors from approximately 143 countries. Soft-close hardware, designer drawer sides, cabinet and drawer organization and 3D printing were among top trends from the more than 1,561 exhibitors.